The Federal High Court in Lagos on Tuesday discharged former Minister of State for Defence Senator Musiliu Obanikoro as a witness in the trial of former Ekiti State Governor Ayo Fayose. Obanikoro testified as the fifth witness of the Economic and Financial Crimes Commission (EFCC). 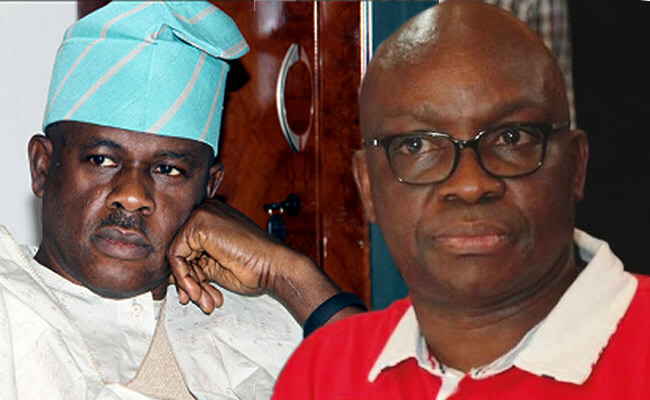 Under cross examination by counsel for Spotless Limited, Fayose’s co-accused, Mr Olalekan Ojo (SAN), Obanikoro said there was no documentary evidence to back up all he said in court. Ojo asked the former minister about his late personal assistant Justin Erukaa, whose statement made during investigation was earlier admitted in evidence. The witness said: “Erukaa left Lagos a day before Salah about two years ago. After Ojo said he had no further questions for Obanikoro, prosecuting counsel Rotimi Jacobs (SAN) called the sixth prosecuting witness (PW6), Mr. Olugboyega Omotayo Falae, a banker. The EFCC had alleged Fayose acquired a property on 44, Osun Crescent, Maitama, Abuja in the name of his elder sister, Moji Oladeji, with N200million. Falae, who works with Ecobank Nigeria, said he was a staff of Skye Bank (now Polaris Bank) when the transaction occurred. He said as head of the estate support department, he knew about how the property came to be sold. He said the Osun Crescent property was one of those the bank decided to dispose of. Falae said once the bank’s management gave approval, a list of properties was given to agents who would source for buyers. He said the bank got offers, including one from one Mrs. Titiloye Orebiyi. “Eventually we agreed on N200million for the property. The documents of the transaction were submitted to the EFCC. “On April 20, 2015, we wrote an internal memo and a letter of acceptance to the Managing Director of Signature Integrated Ltd (Mrs Orebiyi) accepting their N200million offer and indicating which bank account to pay to,” he said. The court admitted some of the transaction documents in evidence. Fayose is on trial for allegedly receiving and keeping N1.2billion and $5million allegedly stolen from the Office of National Security Adviser (ONSA) contrary to the Money Laundering Act. He pleaded not guilty when he was arraigned on an 11-count charge last October 22. EFCC said Fayose and Biodun Agbele, who is facing a different charge, allegedly took possession of N1, 219,000, 000 on June 17, 2014 to fund the former governor’s 2014 gubernatorial campaign. EFCC said Fayose, on the same day, received cash payment of $5million from Obanikoro, without going through a financial institution, the sum having exceeded the amount authorised by law.